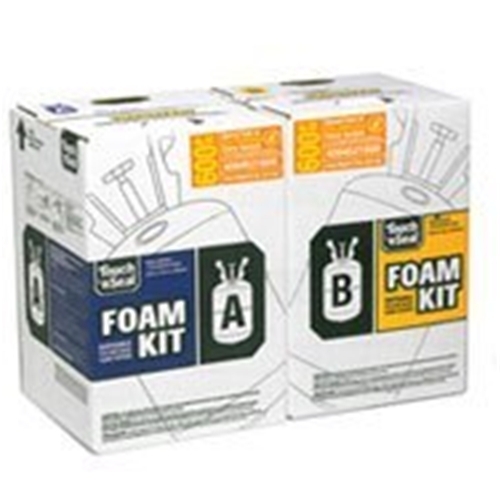 The Touch and Seal Foam Kit U2- 600 yields approximately 600 board feet of 1.75 LB density, closed cell spray foam (2.0 LB). The Touch and Seal Spray Foam Kits are great for cold storage, touch-ups, or wall insulation applications. The kits come pre- packaged in a convenient, disposable, single use container. Use spray foam kits for a DIY spray foam application, or for quick touch ups on commercial jobs – the spray foam dries in less than a minute, providing for quick and easy applications, particularly ideal in high traffic areas or general spaces not actively under construction. For both home and commercial jobs, individuals and contractors alike can benefit from convenient spray foam kits. Everything you need in one easy place, making small applications and repairs a breeze. In commercial spray foam, a kit can keep your jobs on schedule and allow for repairs to be fast and accessible. Having your crews and job sites prepared can help avoid costly delays. With the Touch and Seal Foam Kit U2- 600, even a beginner can easily complete an application – The hoses are pre-connected and color coded, and the application design gives a fast and consistent flow of spray foam. The foam will expand up to 30X it’s original size, and covers up to 600 board feet – Drying in under a minute. For spray foam solutions and more, shop Intech Equipment and Supply for Expert supplies and professional assistance every step of the way. Our pros can assist DIY and seasoned experts in selection, comparison and more – ensuring you make the proper equipment purchases the first time, saving you both time and money. Shop Intech Online today, order The Touch and Seal Foam Kit U2- 600 and more – or give us a call for fast, friendly service.